Bobby Conte Thornton and the cast of A BRONX TALE. Photo by Joan Marcus. Bobby Conte Thornton and Nick Cordero. Photo by Joan Marcus. It is the rare Broadway show that leaves its audience disturbed by gun violence and racial slurs even as they go happily humming doo-wop on their way out of the theater. And indeed it is the rare Broadway show that attempts to portray gangsters as something other than secretly good-hearted slobs. But such is the case with A Bronx Tale, a winningly performed but losing-ly scripted musical based on a movie based on a one-man show based partially on actual events. Playwright and actor Chazz Palminteri gives us the coming of age tale of an Italian-American boy named Calogero (Hudson Loverro when a child, Bobby Conte Thornton when on the cusp of manhood). Young C, as he is called, faces the basic Shakespearean father figure dilemma. His biological dad, Lorenzo (Richard H. Blake) is a good-hearted, bus driving, family man, but the adult he truly admires is Sonny (Nick Cordero), an all-powerful mob kingpin. As he is busy being pulled in both directions, he falls for Jane (Ariana Debose), the right girl with the wrong skin color. Luckily for C, he lives in a musical theater world where no crisis lasts more than a couple minutes. Murders are forgotten about and accusations pivot for no apparent reason. In a less than satisfying conclusion, C’s choice of male role model is made for him and he gets the girl, but then ultimately forgets her. And wait, was that a hint that maybe Lorenzo isn’t his real father that went flying by? There’s also a very confusing moment involving a guy running with a Molotov cocktail, but never mind. Fortunately, the cast shines, with Mr. Cordero being the brightest of the stars. Whether crooning, Sinatra-like, in a beautiful baritone, or endowing Sonny with just the right amount of pathos, he effectively steals the show from Mr. Thornton, who sings well but lacks Cordero’s stage presence, or Palminteri’s stage presence for that matter. The odd couple directing duo of Jerry Zaks and Robert De Niro find many a mobsterly detail to keep the huge ensemble busy. In a cinematic piece of staging that will undoubtedly be stolen when someone decides to write Goodfellas, the Musical, we meet Sonny’s crew in a bar with the action pausing as each character poses for a mug shot while Sonny reels off his gangster nickname. It’s highly reminiscent of the De Niro film. Meanwhile, Beowulf Boritt’s smart scene design is full of towering fire escapes where various characters magically appear and then vanish. It’s a fitting visual metaphor for a story about a boy who feels the heat as he tries to find the best way out of his childhood. 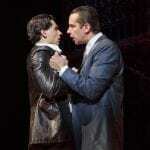 A Bronx Tale – Book by Chazz Palminteri; Music by Alan Menken; Lyrics by Glenn Slater. Directed by Robert De Niro and Jerry Zaks. WITH: Nick Cordero (Sonny), Richard H. Blake (Lorenzo), Bobby Conte Thornton (Calogero), Ariana DeBose (Jane), Lucia Giannetta (Rosina), Bradley Gibson (Tyrone), Gilbert L. Bailey II (Jesse), Hudson Loverro (Young Calogero), Joe Barbara, Michael Barra, Jonathan Brody, Ted Brunetti, Brittany Conigatti, Kaleigh Cronin, Trista Dollison, David Michael Garry, Rory Max Kaplan, Dominic Nolfi, Christiani Pitts, Paul Salvatoriello, Joey Sorge, Cary David Tedder, Kirstin Tucker, Keith White, Michelle Aravena, Gerald Caesar, Charlie Marcus, Wonu Ogunfowora and Joseph J. Simeone. Choreography by Sergio Trujillo; Beowulf Boritt, Scenic Design; William Ivey Long, Costume Design; Howell Binkley, Lighting Design; Gareth Owen, Sound Design; Beverly Jenkins, Production Stage Manager. Music Supervision and Arrangements by Ron Melrose, Orchestrations by Doug Besterman and Musical Direction by Jonathan Smith. At the Longacre Theatre, 220 W. 48th St., 212-239-6200, http://abronxtalethemusical.com. Running time: 2 hours.